Multiple Forms in a Single Page? Is there anyway I can get it so that the extension can autofill in the school code, account number, AND the password? Right now I'm having it fill in the school code and manually entering the account number myself but if there is better way of doing it, that would be awesome. While for a different site, I think you'll find my response in this thread informative, not only on how to get 1Password to record all the details but a little something I like to do afterwards to make it appear more user friendly. Can I ask what browser you're using please. I tried Safari before posting and it seemed to fill in all the fields without issue. It might be this comes down to a browser specific oddity that we need to check out. At the very least it will ensure I'm testing the same configuration as you. I've used Safari 8 and Chrome 43 on the Mac. 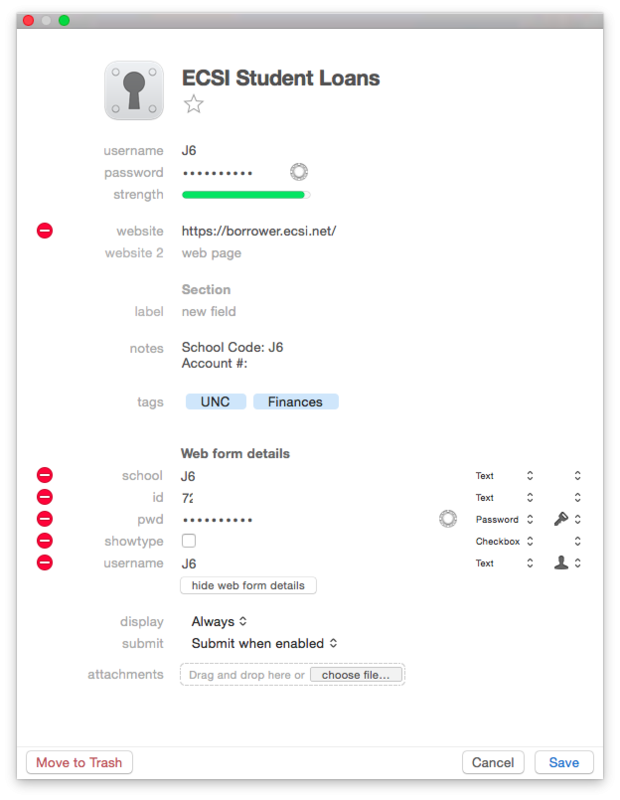 This is what the web form looks like and the entry for my 1Password. Just to confirm, that is the fresh Login item that was made by following the steps in How to manually save a Login? I ask because in both Chrome and Safari the web form detail id is of the Password type for me while what you're seeing is set to the Text type. I also don't have a username field in my web form details. If we're both following the same steps on the same page I would expect the web form details to match, with the obvious differences in their values of course. Now when you're manually saving an item there are two options, there is Save new Login and Update existing Login (see the image below). You are saving a new Login item I assume? I apologise if it seems like I'm doubting you, it's just that we should be seeing the same web form details given everything seems to be the same. Regardless, we will work with you until we figure this out. No thank you so much for your help! I changed the values and it worked. I think the first thing I followed the guide, I must have checked Show Typing and it must have saved as text or something. The second time I updated the existing login out of laziness and that must have caused a problem as well. But after changing the values to match your entry, it works perfectly now! Thank you!